Pumpkin spice latte season – and it is most definitely a season, despite its detractors – is here and it is going strong. I’ve been enjoying a variety of delicious pumpkin spice goodies myself recently, including the new Pumpkin Pie Spice Cookie Butter from Trader Joe’s. This spread is a seasonal twist on regular cookie butter and it not only includes all those warm pumpkin pie spices that we associate with fall baking, but it includes real pumpkin, as well. The spread is delicious on bagels and other baked goods, and I thought it would be a wonderful seasonal variation on my Cookie Butter Latte recipe. As luck would have it, I was right. The spiced cookie butter was easy to incorporate into hot coffee and, while the combination of cookie butter and coffee alone was a bit strange, the flavors really blended well once milk was added to the mix. The sweetness of the cookie butter comes through in the finished drink and you can taste the pumpkin and spice in each sip. 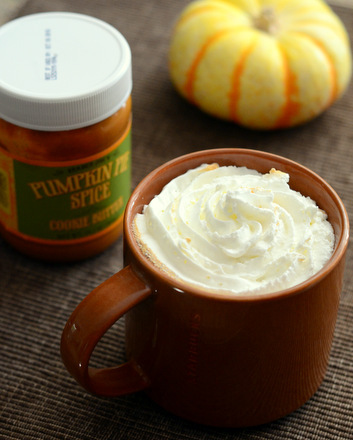 It is sweet, but milder in flavor than a typical pumpkin spice latte would be. I recommend adding a little bit of sugar – I used brown sugar, but white sugar is fine – to your drink, as it will help the flavor of the pumpkin come through a bit more. Top your drink off with whipped cream and, if desired, sprinkle it with cinnamon before serving. In a large mug, stir espresso, cookie butter and brown sugar until cookie butter has dissolved completely. Top with steamed milk. Top the drink with whipped cream and a sprinkle of cookie crumbs. *If you don’t have espresso, use 4-oz strong coffee instead.